This is a guide to walk through the lifecycle of an asset powered by Cloudinary from upload and organization to manipulation, delivery, and analytics. It starts with the simple yet powerful Media Library. The Media Library is the repository of all your digital assets and the folders they live in. It provides you with a list view of your current folders along with a preview of available assets. 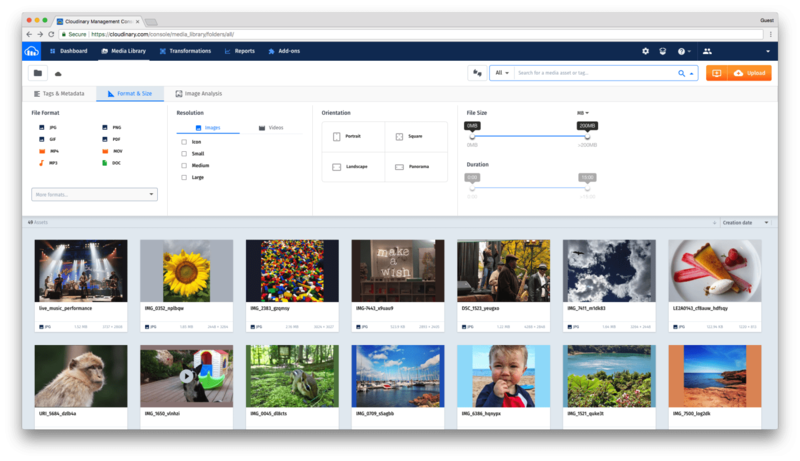 You will find some sample assets in your media library to get you started. 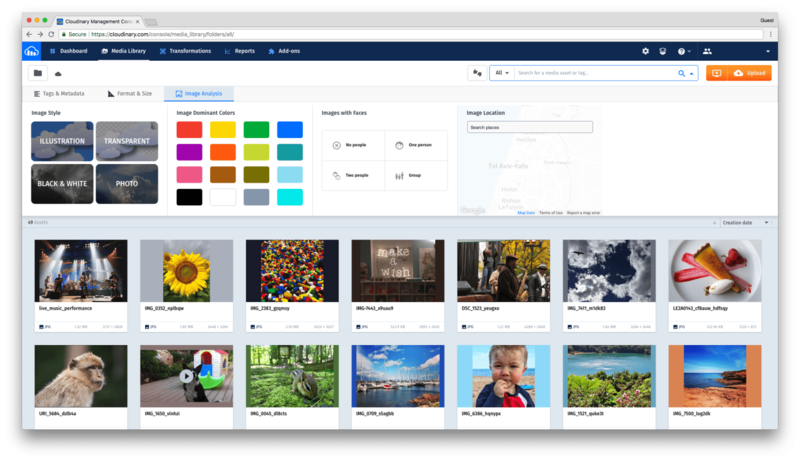 You can easily upload any type of asset including images, videos, and documents, in any format. Either drag and drop your assets into the media library or use the upload widget. 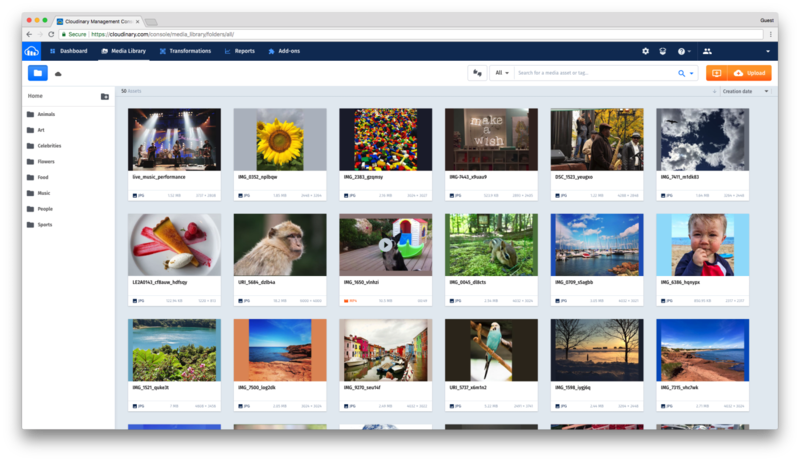 Assets can be uploaded from different sources including local storage, web address, google search and social media. 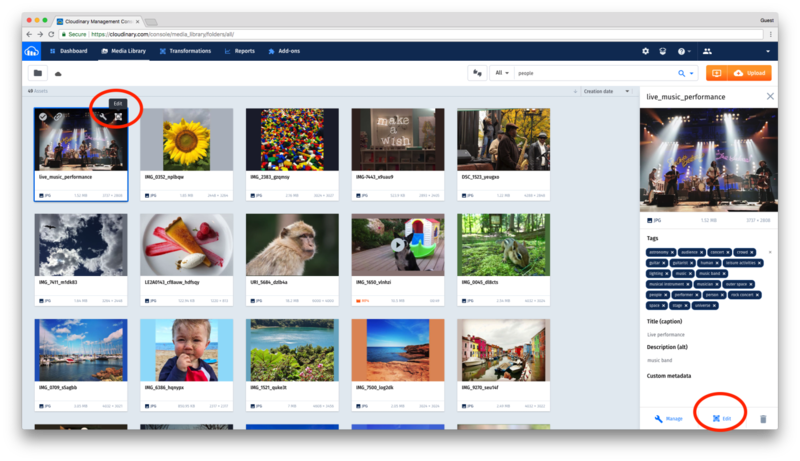 You can even just drag and drop an asset from your local storage. After uploading an asset, you can organize it into existing folders or create a new folder for it. You can then use the preview panel to view the asset, rename or tag it, and even update the associated metadata. Or click on the manage icon in the preview screen or on the manage icon in the thumbnail to access additional options. 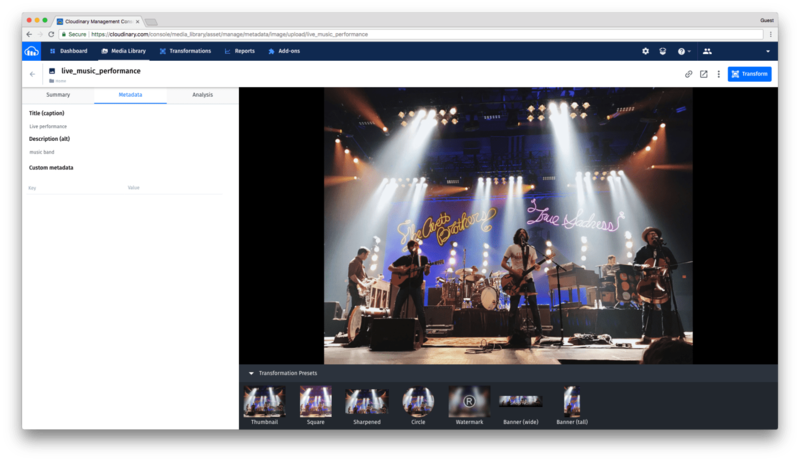 From the asset management screen you can accomplish a lot, from updating the file name to adding or removing additional tags, or even using predefined image manipulations. The Summary Tab provides information associated with the asset including file type, file size, resolution, permission, the date and time of upload, and tags. 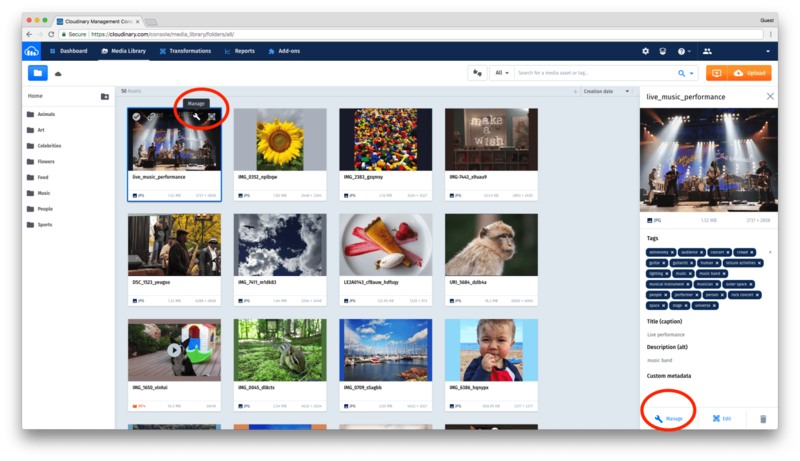 With the auto-tagging add-on enabled, assets will be automatically tagged based on their content. 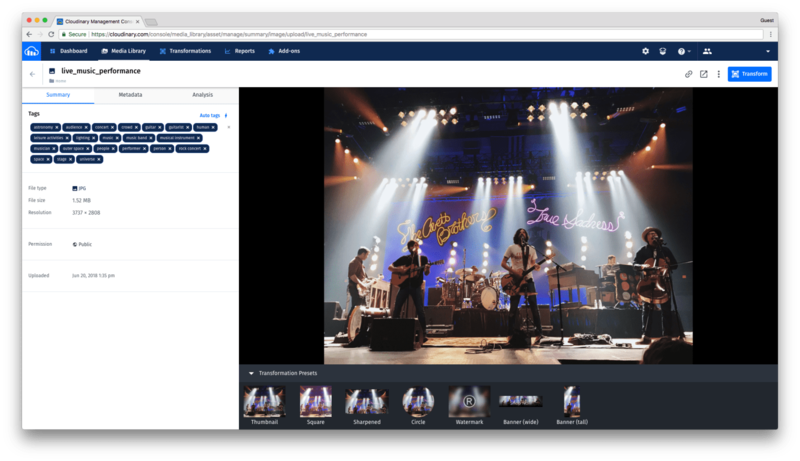 Cloudinary leverages AI to recognize faces, celebrities, colors, objects and scenes, plus you can manually add more tags or remove existing ones. The Metadata Tab displays the asset metadata. Cloudinary automatically extracts and stores embedded metadata, and also allows you to add custom metadata. The tags and metadata information can help you find relevant assets when you need them. The analysis tab gives you an overview of the content, as interpreted by machine learning. 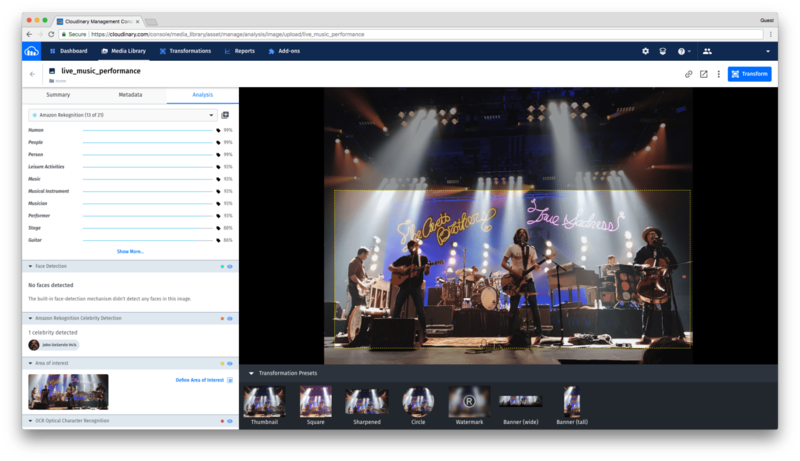 Cloudinary also detects faces, celebrities, areas of interest, text, and even colors, which enables intelligent search and content-aware cropping. 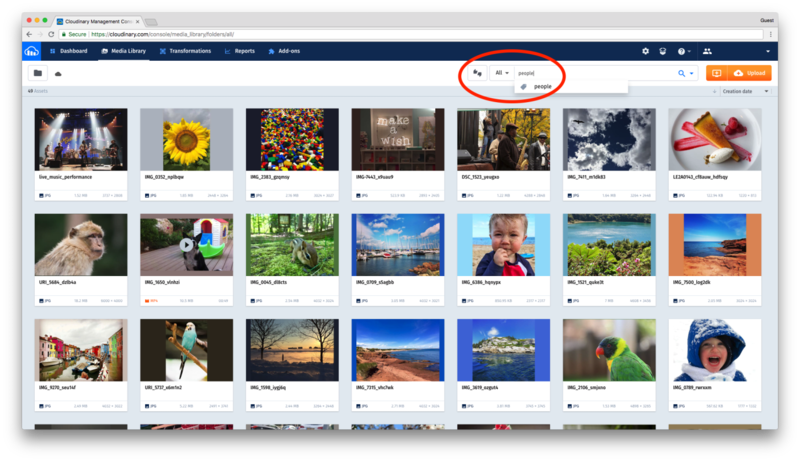 All of this great information about the asset, including tags, metadata, and AI analysis information, allows you to find assets quickly and easily via the search bar. Just type in your search term, you can even narrow your options by type of asset. If you need to broaden your search, you can use the advanced search option by clicking on the arrow to the right of the search bar. 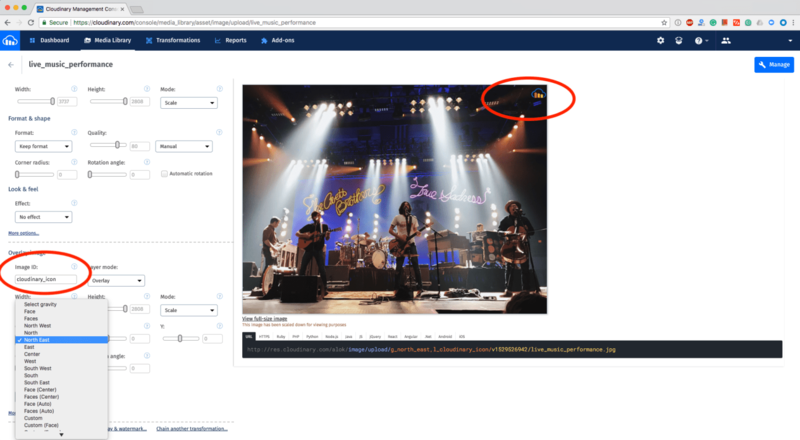 Advanced search allows you to use a combination of parameters including asset type, tags, context (which is the metadata associated with the asset), or upload time...or you can search based on asset properties such as format, resolution, orientation, size and in the case of videos, duration. Once you have the asset, you can easily copy the URL of this asset to share or deliver it. If you want to publish this asset across a number of different channels and devices, all of which require different variants, you can transform it by using different manipulation capabilities. For example, you can change the height and width, crop the asset in different ways, change the format, adjust the quality and Device Pixel Ratio, if you’re familiar with the requirements. 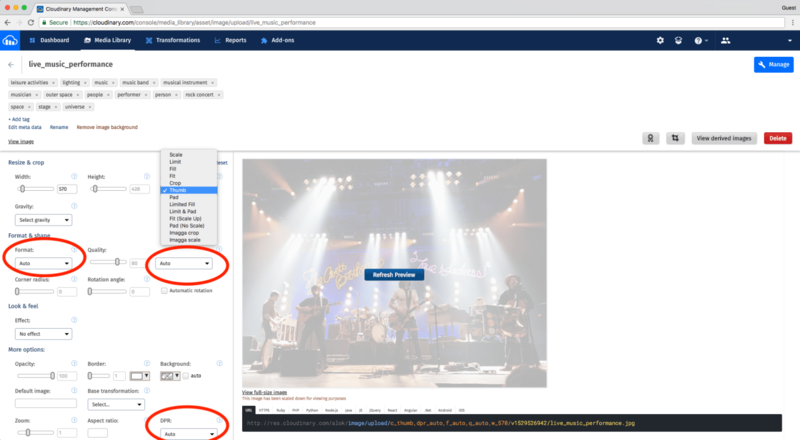 Or you can set these parameters to auto and forget it, letting Cloudinary deliver your assets in the most efficient format, at the best resolution with quality adjustments, for whichever channel and device you need. This enables faster loading of assets for your end-users. You can also apply watermarks, and artistic effects to suit your needs. Once you’re done with your variation, you can hit refresh preview and a new URL will be generated automatically for the derived version, making it easy to share or embed the asset. All of this happens in real time, so you don’t have to wait on anyone. This asset is then delivered to the end-user through a global Content Delivery Network for faster loading and effortless scaling. Last but not least, you can easily understand how your assets are performing through our reporting dashboard which allows you to both analyze your engagement stats and monitor your errors. We hope you enjoyed getting started with Cloudinary. If you need additional support please contact support@cloudinary.com.